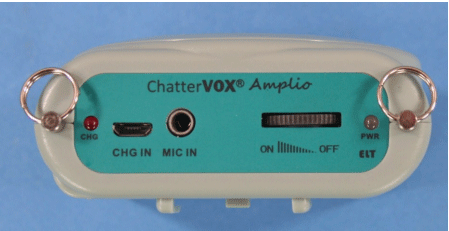 Your new ChatterVOX Amplio is designed primarily to be worn suspended around your neck. While Amplio can be belt worn or placed on a nearby surface, neck worn is recommended. Your new ChatterVOX Amplio is designed primarily to be worn suspended around your neck. While Amplio can be belt worn or placed on a nearby surface, neck worn is recommended. The logic of this recommendation is to keep the sound of your voice close to the visual source. This is particularly important for people with weakened voices as the natural human tendency to reinforce listening with “lip reading” improves the resultant communication. sound is regenerated in an endless looping from microphone to speaker. PWR: GREEN color LED when power is switched on. LED turns AMBER then RED when charge is needed.